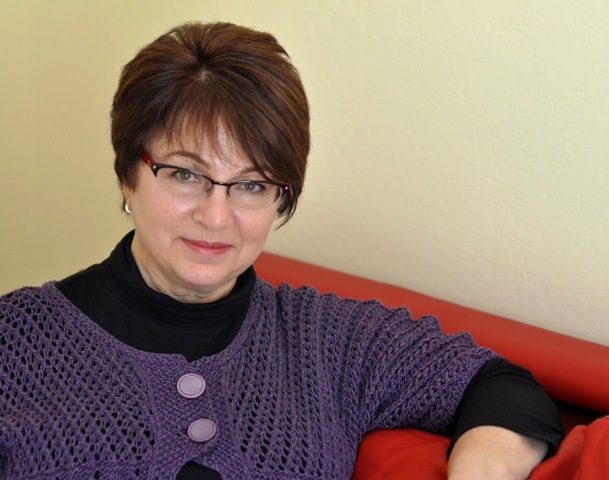 Faina is a very busy designer she currently has 13 new unreleased designs that are in publishers' hands. She teaches at STITCHES, she will be at Interweave's Knitting Lab in San Mateo, Oct 31-Nov 3, and teaches at yarn shops around the country and abroad. 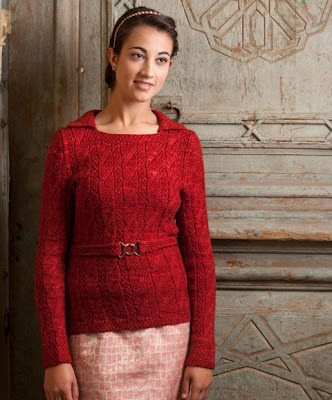 Be sure to check out her class Sizing Knitwear Patterns on Craftsy.com. You can find Faina here and here on Ravelry. I would say that I do not have one definite source of my inspiration. 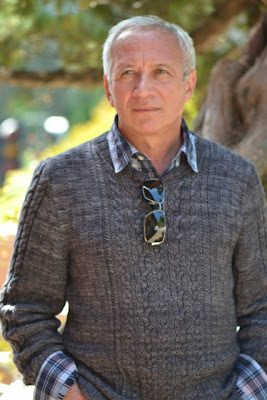 I always loved fashion, so when I see beautifully made clothes (sewn or knitted) either in a fashion magazine, a movie, or just on a street, it catches my interest and makes me happy. I also love architecture and different shapes (I guess my engineering and math backgrounds comes through here). I take many pictures of buildings when I travel and sometimes my inspiration comes from it. Other times, it could be just the color of the yarn or it’s fiber content. It is almost like the yarn is talking to you and tells you what it wants to be. So, all of the above inspires me. There are many. I love texture of all kinds. It could be brioche, cables, slip-stitch techniques, or knit and purl combinations. I also like lace and combination of lace and texture. This depends on many factors. When I begin any new design, I do not think about it. I basically go from size 30 to size 64 with 2-inch increments. If the stitch-pattern repeat is small enough, it is actually possible to stay with almost as many sizes. If a stitch-pattern repeat is 8 sts and more, it makes it hard to grade for sizes and preserve the integrity of the design. In this case, I have to eliminate some of the sizes that are not possible to leave without drastically changing the design. Another factor is publication’s requirements. When I design for my own line of patterns FGDesigns (http://www.ravelry.com/designers/faina-goberstein), I make my own decisions and offer a good number of sizes. If I design for a magazine or a book, the space for a single pattern is a huge issue. In this case, I do what is required within the constraints that I mentioned before. I always look and admire other designer’s work. This is our industry and we need to know each other’s work. I have a very strong sense of what I like and want in my design, so I am not afraid to be influenced by someone’s design. There are many stitch patterns, constructions, and shapes of collars, pockets, sleeves, and cuffs. None of them is a copyright issue. How you use it in one design is where it becomes an issue. This is exactly what I like in design: choosing out of all possible shapes the one that fits and flatters the body when it is put together with a certain texture and stitch pattern placement. That is what allows us to create a unique design. I think that we should have patterns for all levels of knitters. Like in any craft, we have people who are eager to know more and more about knitting or crochet, so we should teach them by offering challenging patterns where they can learn a new technique, construction, and how to read charts. We should not “dumb down” these patterns because we will not serve this group of people and our designs will not be what they are. At the same time if person wants to stay with what they know and they do not get bored with it, they should be provided with enough patterns to do just that. If they do get bored, there is always the next level to reach. I think as designers, we choose our knitter and design for her/him, so I do not see this issue as a controversy since we have so many patterns out there. Until recently, I always made my own samples. 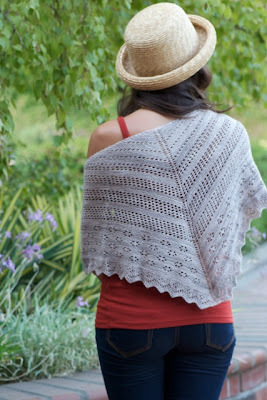 I think about 3 years ago I started to contract sample knitters when I am overwhelmed with deadlines. I still knit many projects myself, but a good knitter can help to produce more designs… I have one very skillful knitter Irina whom I trust completely and, since she has spoiled me, it is not easy to find a match. I am looking, though. No, I was not that formal about my business until recently. Now I am thinking that I should be more businesslike. A few months ago I took a good look at what I do and what is available for a designer/teacher/author in our industry. It is not possible to do everything in our very diverse field. My plan is in my head at the moment, but I am very confident in what my business should look like. This helps tremendously to say no to things that are not fitting into this plan. I would recommend to anyone who is new to this business to make this plan as soon as they get a good feel for what they want to do. Huge impact. It is my most valuable marketing tool. I have my website (http://fainasknittingmode.blogspot.com) where I also interview designers on my The Designer’s Studio page (http://fainasdesignersstudio.blogspot.com) and do reviews of the books and products, and I use Ravelry (http://www.ravelry.com/designers/faina-goberstein), Facebook (Faina Goberstein), and Twitter (inasilver). Absolutely. I do grade for sizes myself and try to write good patterns, but as we all know, we do not see our own mistakes. I would never publish a pattern without a check by a tech editor. It is a must for me. Could you tell us a little about your book, The Art of Seamless Knitting? Sure. 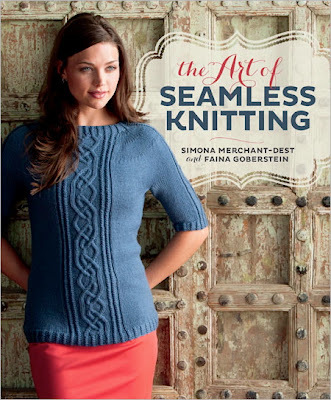 My friend and co-author Simona Merchant-Dest and I see it partially as a reference book that can be viewed as a step-up from or a complement to a book on how to knit seamlessly. 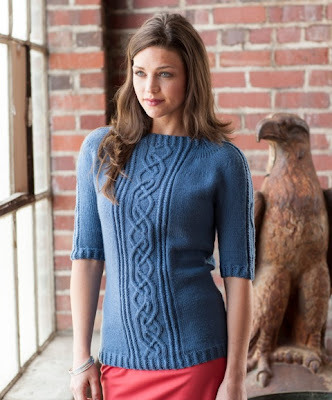 The book’s emphasis is on the adaptation and application of such stitch pattern families as Cables, Lace, and Texture for some popular and less known seamless (or nearly-seamless) garment constructions. In the book you will find many tips and suggestions for a custom fit, an existing pattern adaptation, or an original design. We offer a nice collection of 11 elegant and timeless designs. We hope that these designs alone make it worth buying this book. The next three photos are of garments created by Faina's co-author Simona Merchant-Dest. At the same time, we use these designs as a teaching tool for explaining various techniques as a project is worked in one of the seamless constructions. In this book you will find topics such as placement of stitch patterns, combining different techniques, invisible decreases within the stitch pattern, a perfect fit, couture finishing techniques, choosing a cast-on and a bind-off, adapting a pattern to make it yours and many more. We both like seamless constructions and want to share with our readers our acquired knowledge. It would make us very happy to know that we helped people to master these constructions. Here are photos of our designs from this book. It was never hard for me to maintain this balance. I am very lucky that my husband is a creative person himself. We do a lot of things together, but respect each other’s space. Our son and daughter saw us working full-time at the college changing parenting shifts. Our family live was always integrated with day work and other interests. Now our children are grown we have more time to do what we love. I am a professional and welcome any constructive criticism that can better the outcome in my work. At the same time, I learned long time ago that I couldn’t please everybody. If I see that the criticism is of some value, I would take it in consideration. Otherwise, I respect any person’s opinion and do not get frustrated. I always know myself if I did a good job. If you are asking about my knitting career, I still can’t support myself doing just that. This is my supplemental income. I have a MS in mechanical engineering and first worked as a design engineer. Later I began to teach math at the college. My designing was always my creative outlet and I never thought of that as a main income. I would strongly recommend coming to TNNA, even if it feels that you are spending your money, but did not earn it yet. It is the best investment you could make. That’s where you get to know people in the industry, make contacts, and get prospective jobs. Really informative. Please give more interviews with designers like Faina!